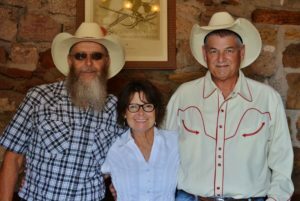 Gypsy Twang members include Sarah Barker, John Williams and Steve Huhn. Our unique brand of music includes original, traditional, singer/songwriter, and vintage country tunes. As we’ve progressed, we’ve found ourselves leaning more and more toward original tunes penned by John and Sarah as well as dipping in to our traditional country and Red Dirt roots. We often feature talented musician friends on gigs, and consider music to be a family affair. All three of us have attended WoodyFest from the early days, and this festival holds a deep place in our hearts.